The thick of summertime LGBTQ pride events is upon us and for all you kitty girls and muscle queens, it’s easier than ever to suit up in stylish gay garb. From casual footwear to high fashion, in both subtle and bold forms, the rainbow motif is a growing part of the wider style vernacular. Gays do control the creative process at many fashion and apparel companies, but that has been true for decades. The modern rainbow fixation has taken on a grander meaning, in the age of social media, anti-bullying, and calls for greater human unity, gay and non-gay. It’s graduated beyond its niche and presents an opportunity for brands and retailers to capitalize on the global LGBTQ spending power. Most recently, Christopher Bailey integrated the six core colors of the rainbow in his last collection for Burberry, to highlight the need for inclusion and solidarity in the community, which as a group is still marginalized in many parts of the world. This $8,500 diagonal-striped nappa leather jacket cracks me up (who would wear it?!). The same collection included this $650 rainbow check tote bag, a nod to check-mania of the 1990s. Paul Smith, Gucci’s Alessandro Michele, Saint Laurent’s Anthony Vaccarello, Valentino’s Pierpaolo Piccioli, and Marc Jacobs are also fond of the multicolor theme. 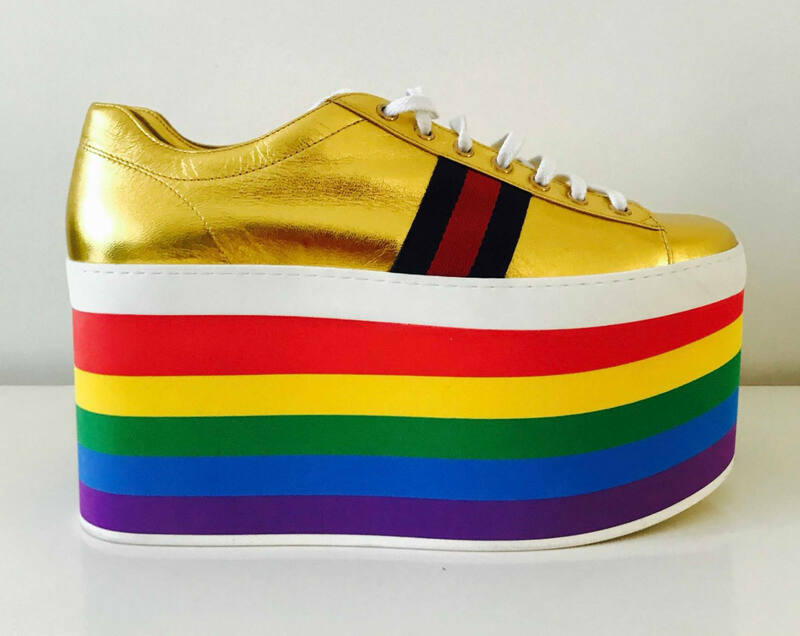 This year, Macy’s is planning a series of Gay Pride Month events in collaboration with special collections from brands like Michael Kors and Levi’s. Last year, Converse launched an entire line of LGBTQ Pride footwear. Objectively, outside of having a strong political connotation, the rainbow color spectrum is charming, cheerful, and vibrant—perfect for celebrating the inclusion of every shade, shape, and persuasion. It also jives well with the current general spirit of exuberance in fashion, itself a reflection of the global political upheaval that is ongoing. (Somewhere) beyond the rainbow, it’s anything with shine, sparkle, and the symbolism of bursting free from convention that’s also apropos of gay pride. I myself am innately drawn to shiny things made with sequins, or glitter, or patent leather, just one reason why I follow RuPaul’s Drag Race so fervently. For more gay garb ideas, check out my Pinterest board.